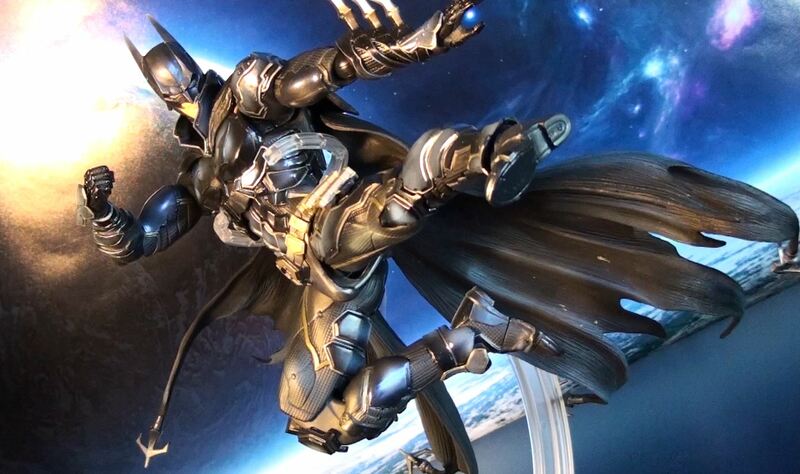 Square Enix’s Variant Play Arts Kai kicks into high gear with their version of the Batman. 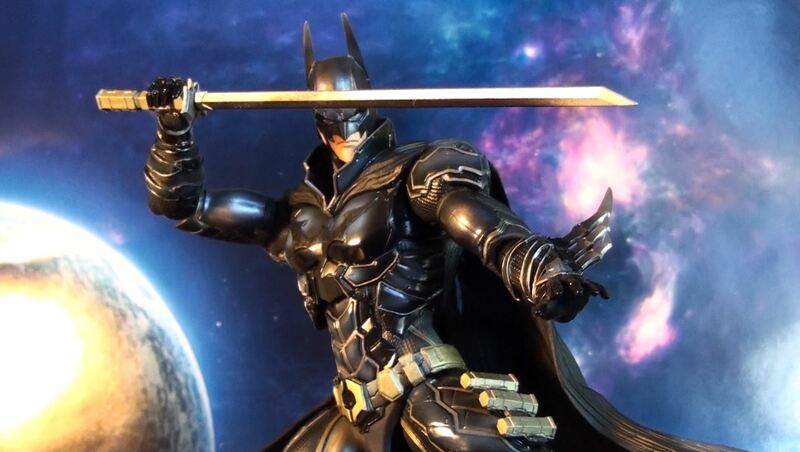 Using elements of Japanese armor, Batman’s design has a very Final Fantasy feel to it. 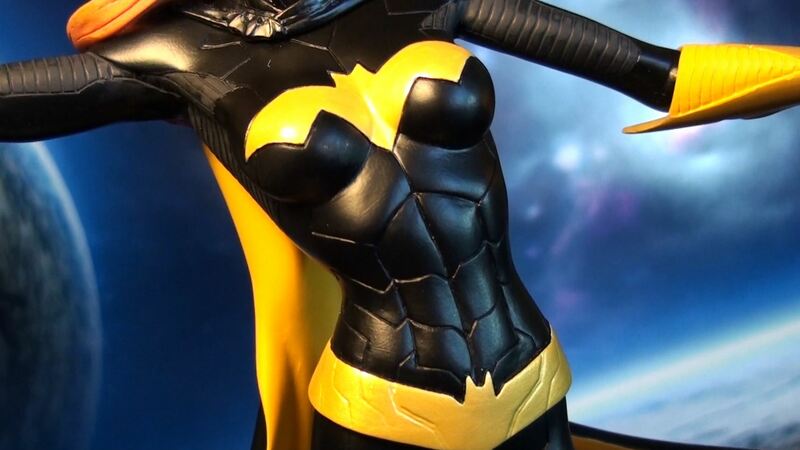 Beautiful paint app work brings life to this armor like I’ve never seen. 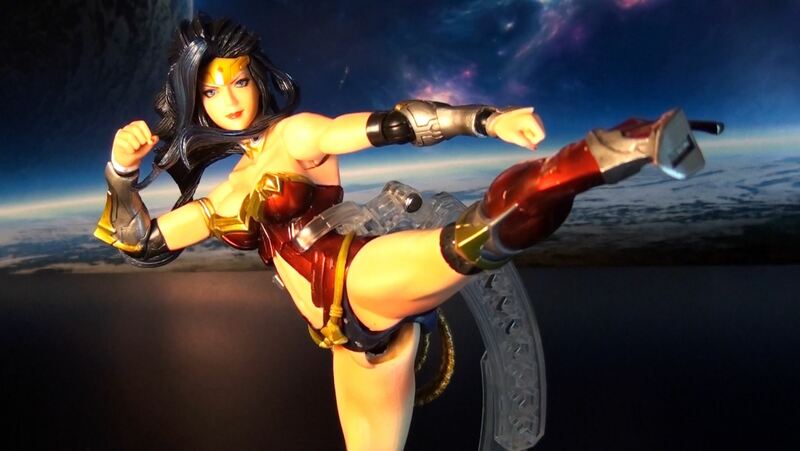 Top notch sculpting and a wide range of articulation makes this one of Square Enix’s best figures to date. 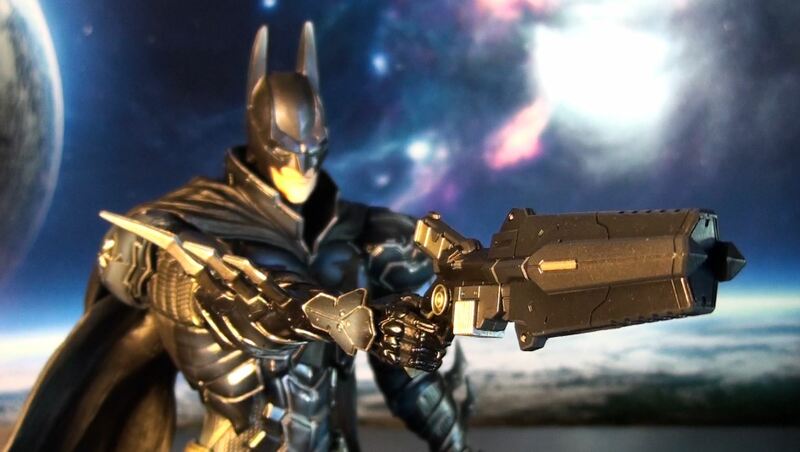 Batman includes extra hands, batarang, ninja sword, gadget gun, and display stand. 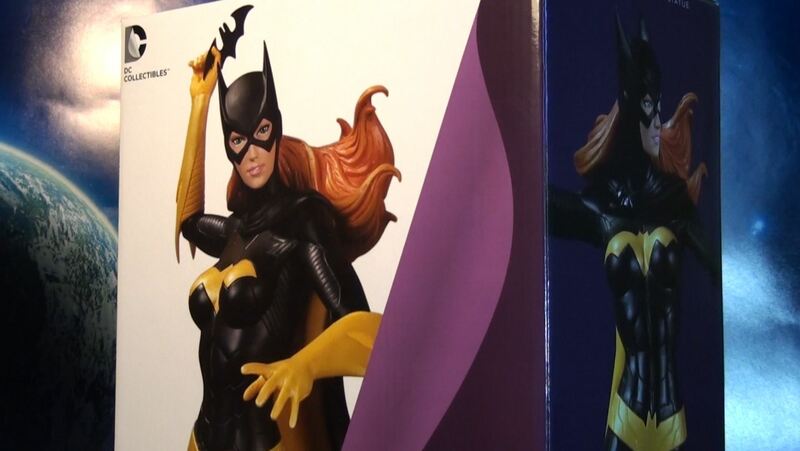 Priced between $60-$75 (bigbadtoystore, amazon). 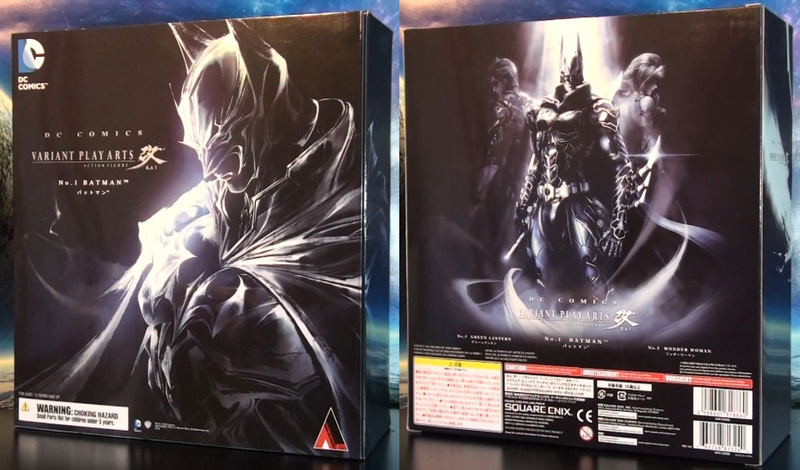 Square Enix takes a stab at their version of DC Comic character with the Variant Play Arts Kai series. 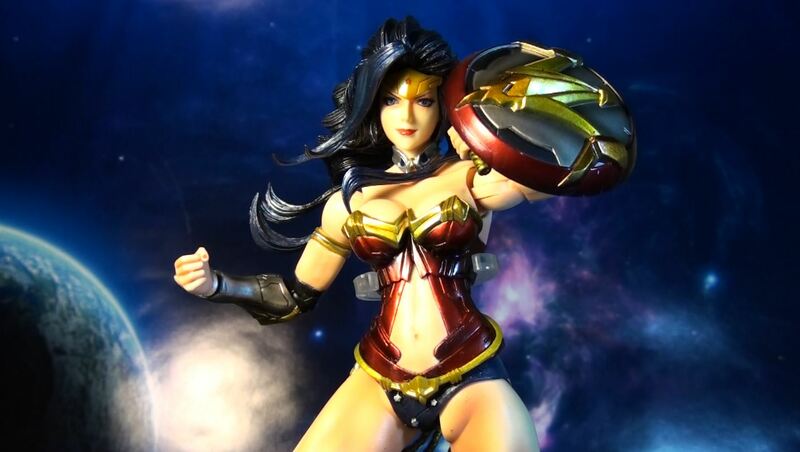 Wonder Woman stands at 10 inches tall and sports a very Final Fantasy style design. 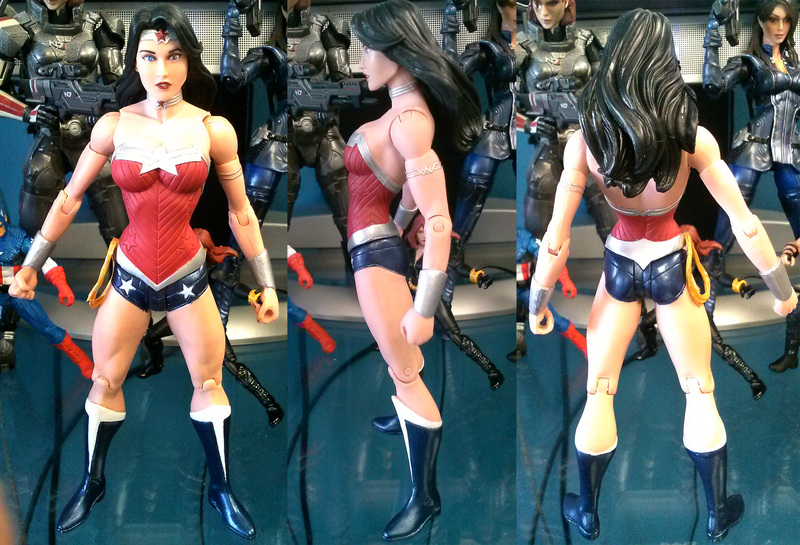 She includes alternate hands, shield, and display stand. 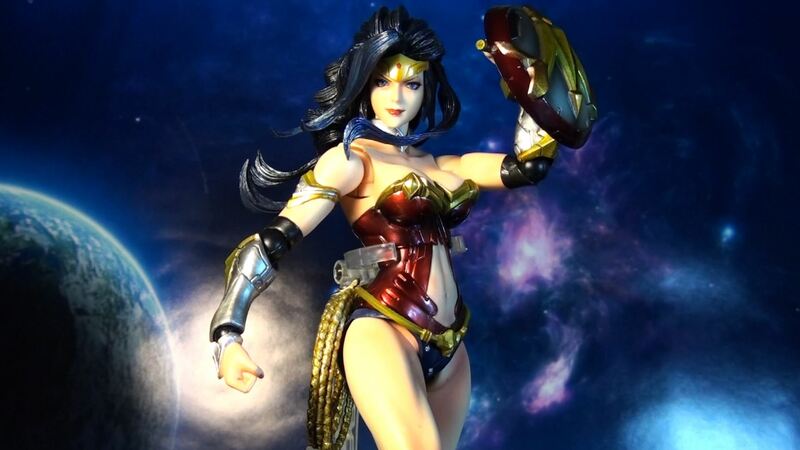 Sells between $60-$75 (Amazon, bigbadtoystore). Exclusive to Toysrus for $17.99 is this Elite style Triple H. Note he sports his new short hair style. 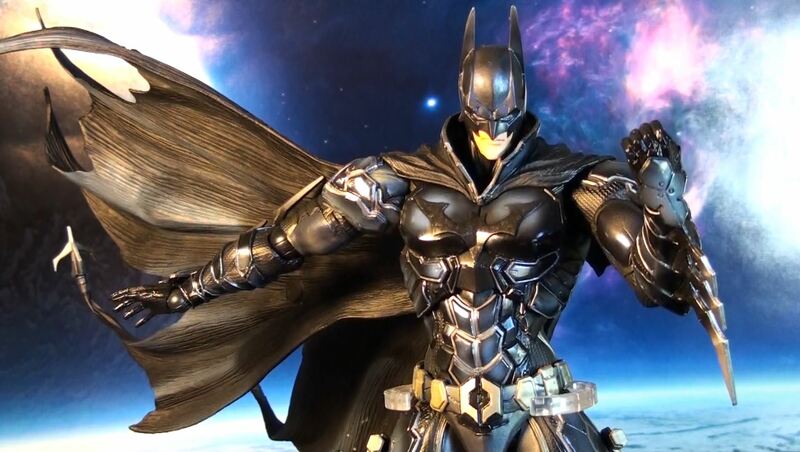 Features Elite style articulation and comes with detachable cloth shirt and sledgehammer. 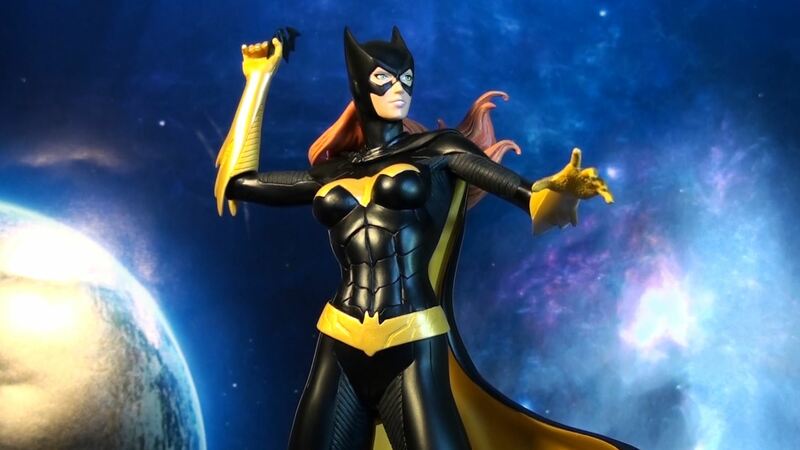 DC Collectibles re-releases 3 of their New 52 Justice League figures with this 3-Pack dedicated to the recent Trinity War storyline going on in the comics. 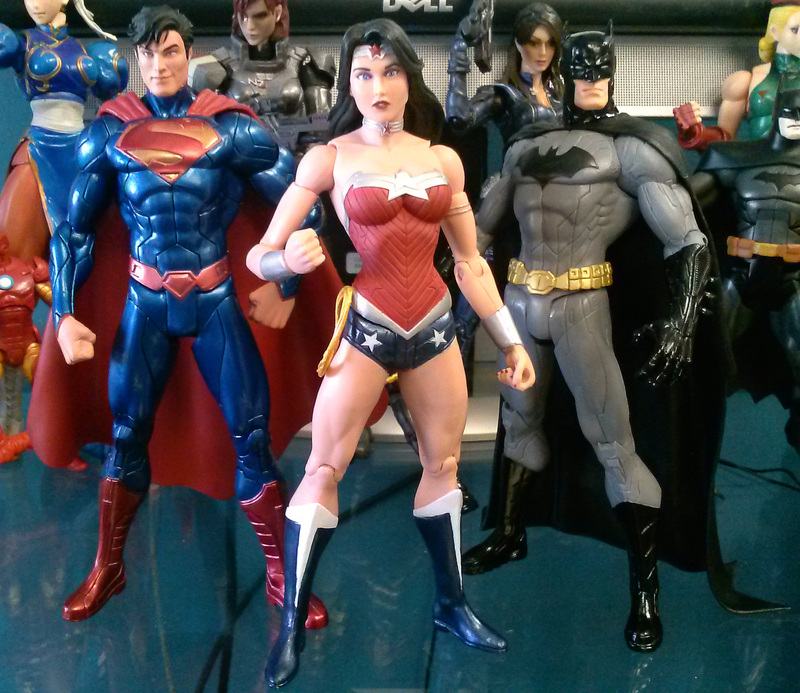 Features Superman, Wonder Woman, and Batman. 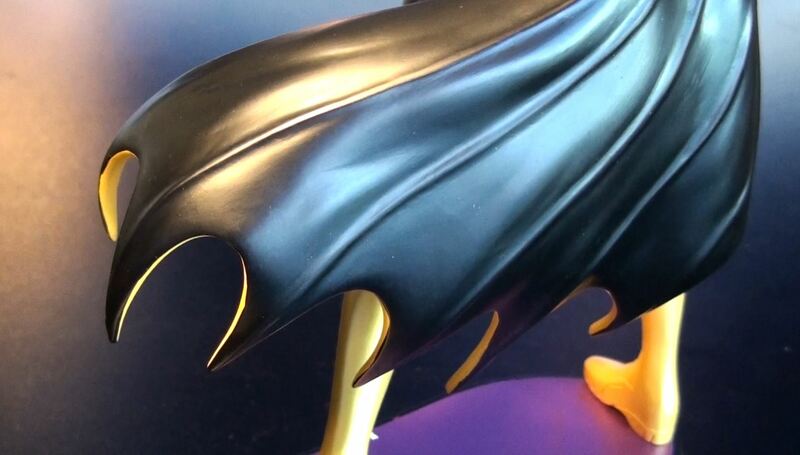 Superman features a metallic paint job while Batman is simply the same as before from his original release. 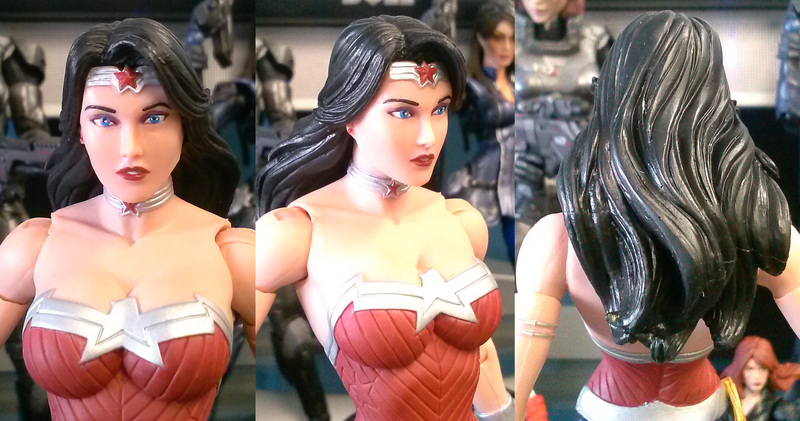 The big change is with Wonder Woman’s new head sculpt. Softer features and long flowing hair. 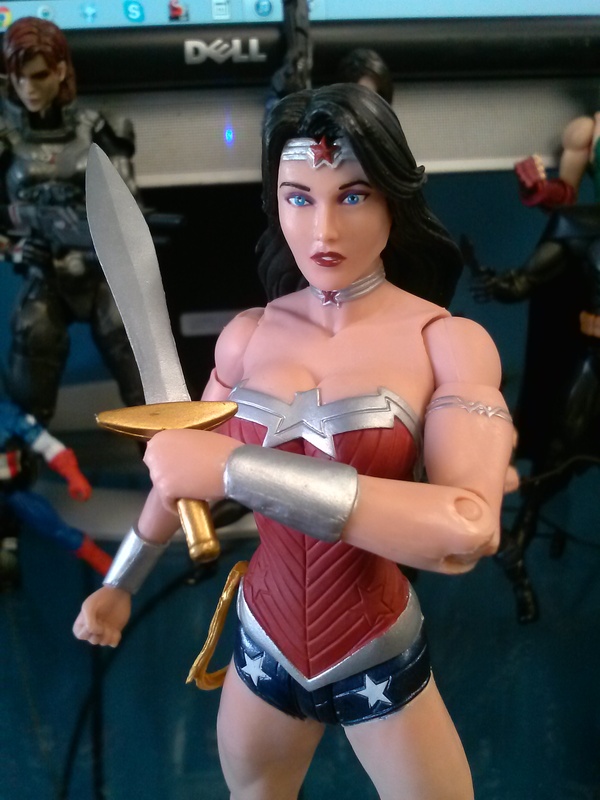 Her body sculpt is the same as before but uses a metallic blue. 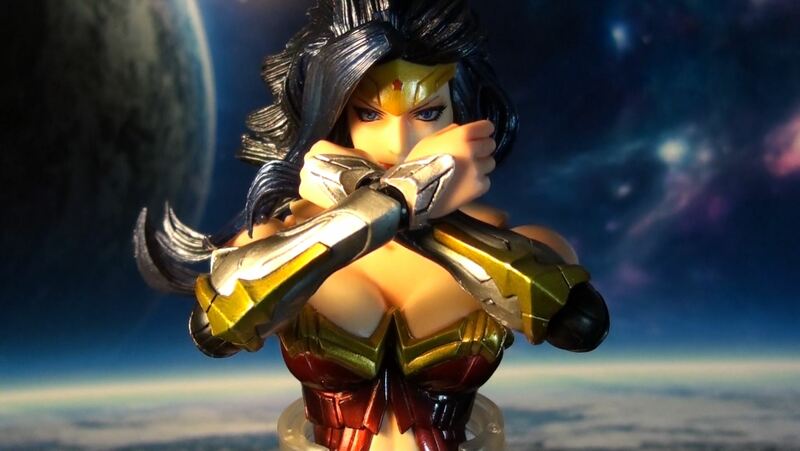 She doesn’t include the sword that originally came with the 1st release so you’ll have to borrow it if you own that figure. Pretty awesome 3-Pack for $49.95. 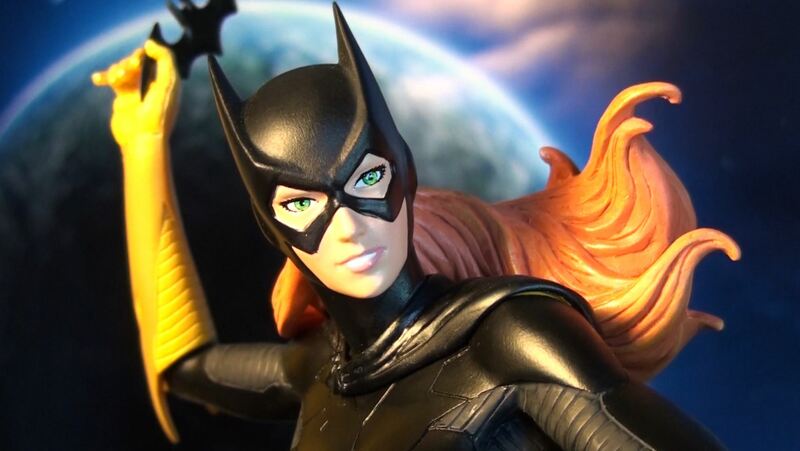 If you don’t own these figures already its definitely worth thinking about picking up. Even though TF Prime is off the air, the toys keep rolling out. 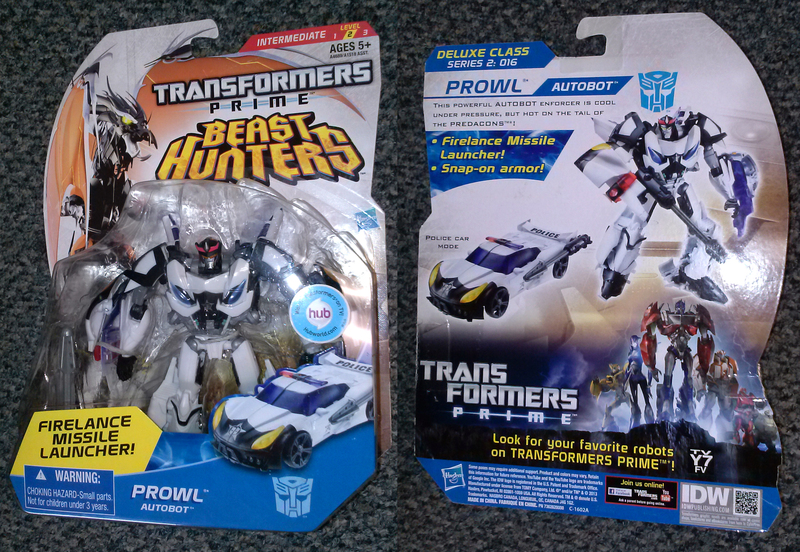 Spotted Prowl at my local Target ($14.99) and love how Hasbro handled this figure. He uses the same bold mold as the previously release Smokescreen with new paint apps, new head mold, and light bar. 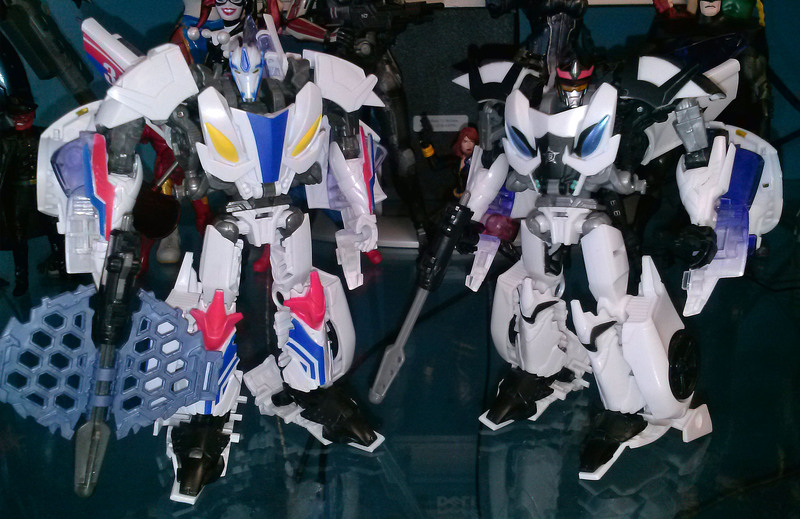 He’s whiter in color than Smokescreen which is really nice. 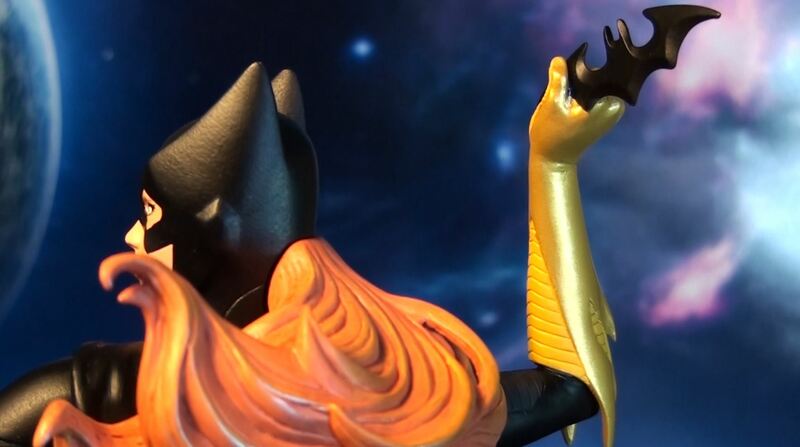 The head mold has more of TF Animated feel than his Classic G1 look. The light piping is one of the best I’ve seen in a long time. 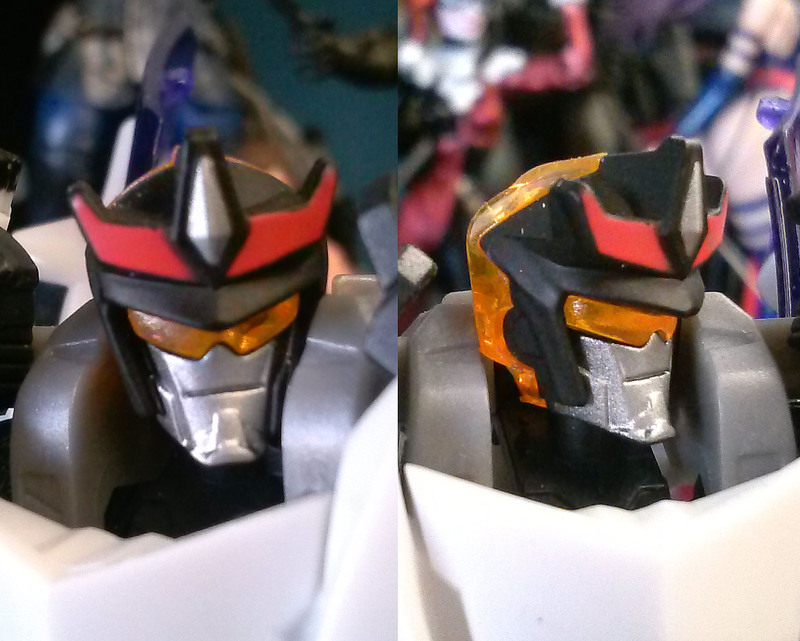 Next to Smokescreen, you can see how Hasbro can craft out another character with some simple changes. 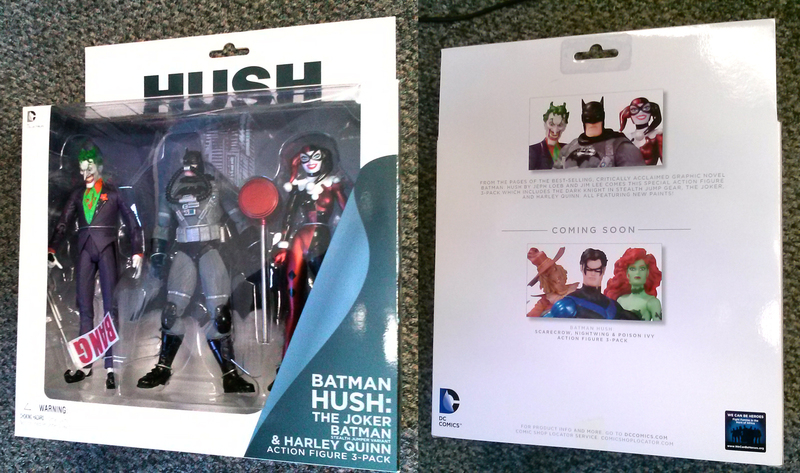 DC Collectibles re-releases 3 of its Batman Hush figures in this cool 3-Pack featuring Stealth Jumper Batman, Joker, and Harley Quinn. Priced at about $50. 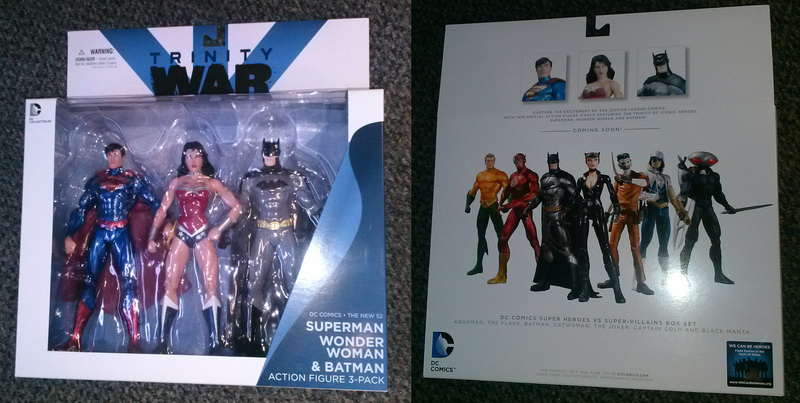 The packaging is pretty plain, done in the same style as most DC Collectible action figures these days. 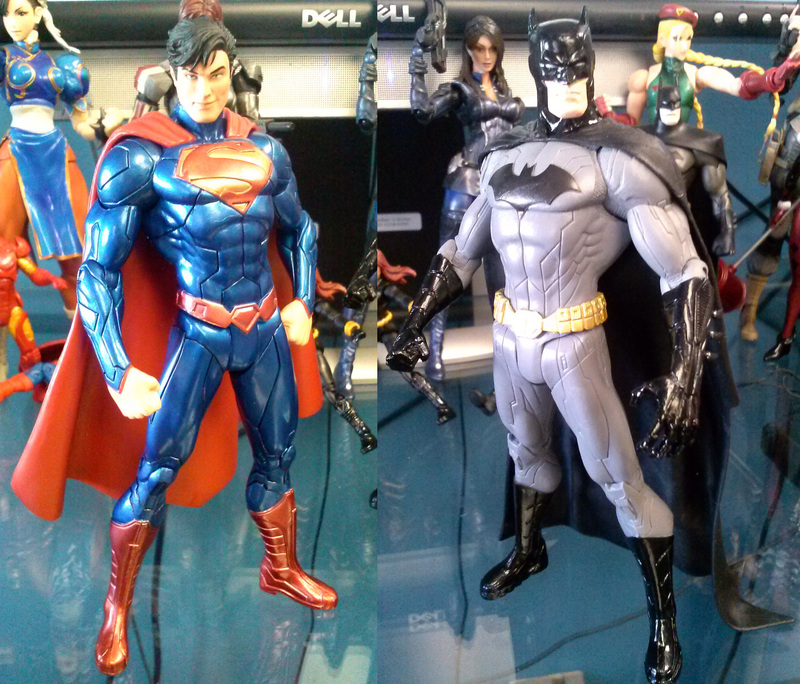 All the figures use the original molds when they released originally under the DC Direct brand name but with better quality paint apps. 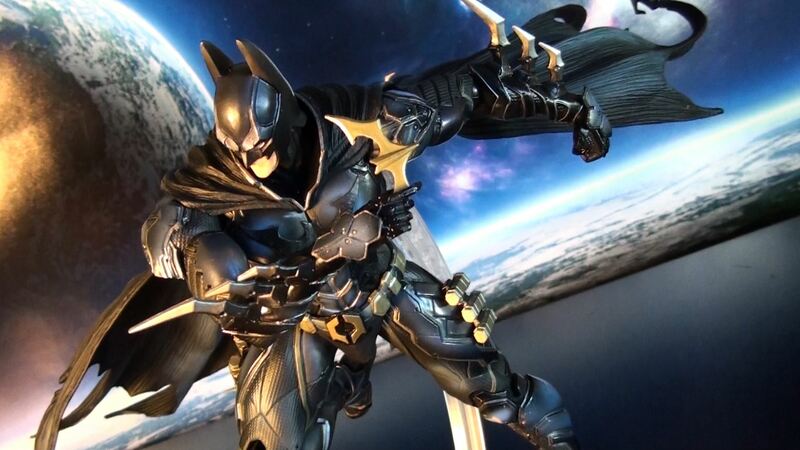 Here’s Stealth Jumper Batman. Next we got the Cown Prince of Crime the Joker. I like this one a lot. Captures the Joker’s insane persona so well. 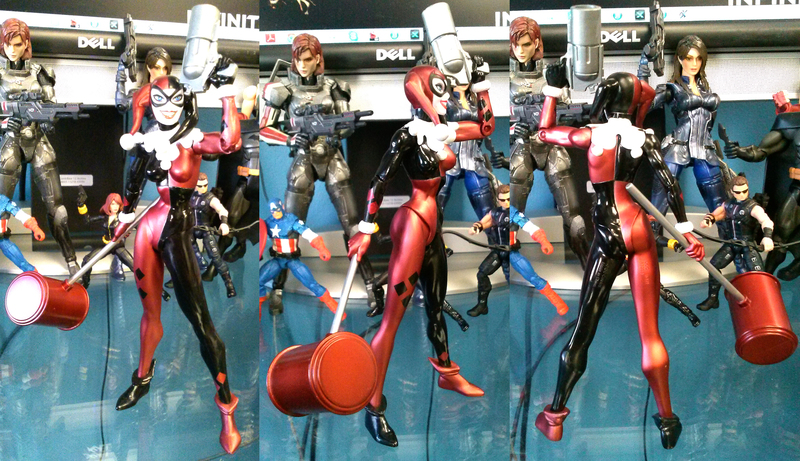 Harley Quinn is pretty awesome in her own right. Liking the metallic red a lot. 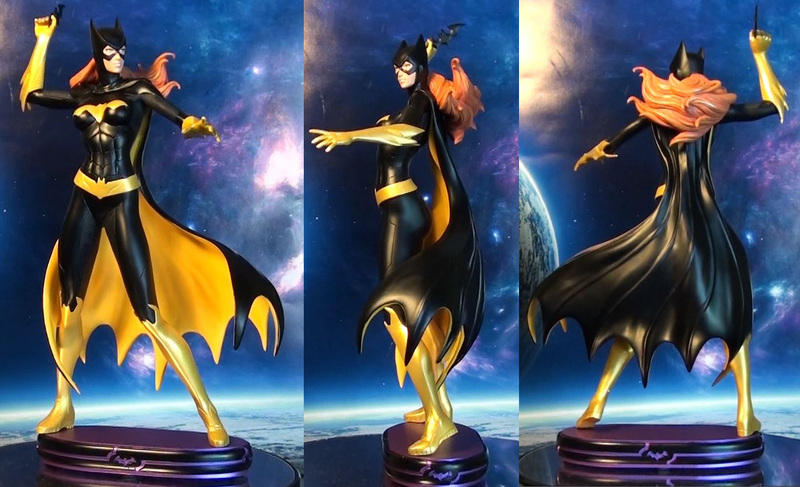 Based off the art of Jim Lee, his style is captured very well but I think Batman is the least favorite of mine in this set. 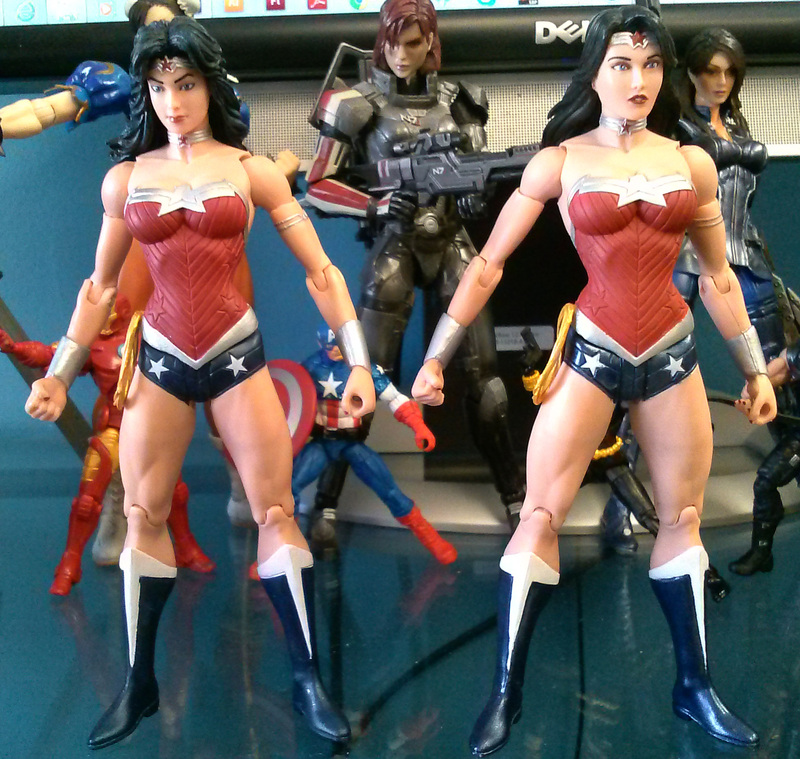 Articulation isn’t great but if you’re familiar with DC Direct then you already know this. 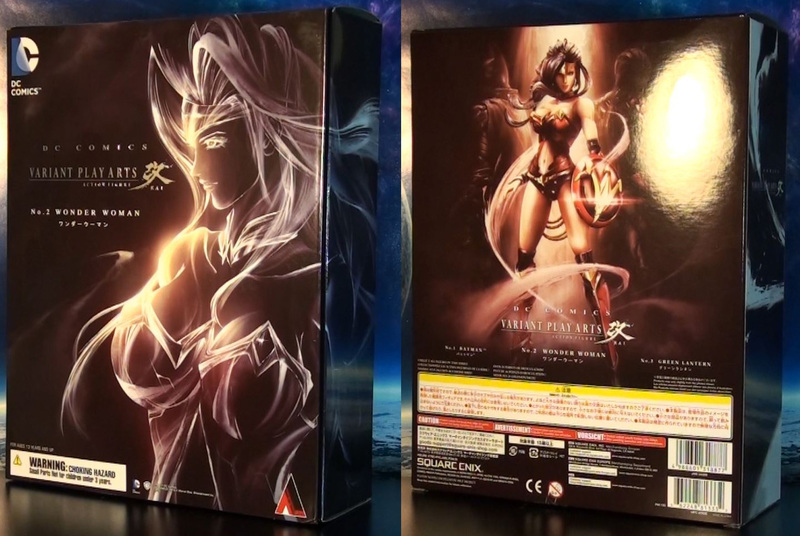 These are basically mini statues in my opinion. 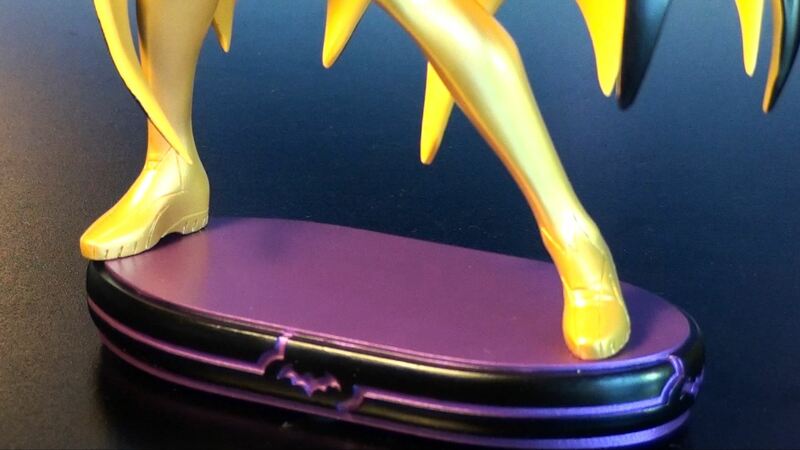 One big thing to keep in mind, Quality Control has never been great with DC Collectibles. When I went to bend Harley’s left elbow for the 1st time, it broke right off. 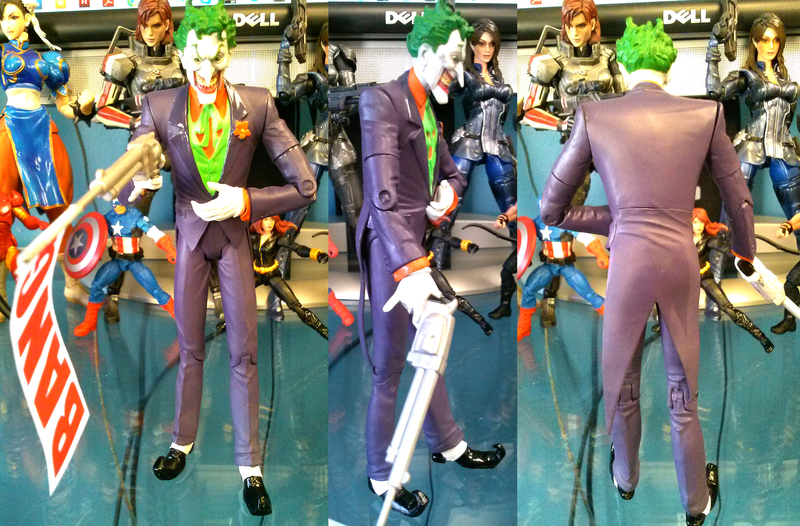 The Joker has really tight arm joints that I’m fearful the same thing will happen if I bend parts with him. With that said, buy from a place with a solid return policy.